The Kanata Pony was developed in the late 1950s and early 1960s in western Canada. 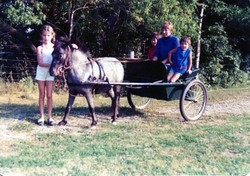 The Canadian Kanata Pony Association and Registry, founded in 1966, was based in British Columbia. This elegant children's pony with the Appaloosa coat pattern was created by crossing Welsh and solid-coloured Shetland Ponies with Appaloosas, then crossing the results of these crosses with each other for the following generations. The result was an English-type spotted pony under 14 hands (56 inches) tall by age 6. There was no lower limit on size, provided correct type and colour were maintained. A Kanata Pony named Polka Dot. The Kanata Pony looked similar to this small Appaloosa. From the beginning, the Association wanted to get the Kanata Pony recognized as a distinct Canadian breed under the Livestock Pedigree Act by Canada's Department of Agriculture. The Department informed the Registry that three or four generations with no outcrossing were needed, and that 1,000 such ponies had to be registered to qualify for breed status. By 1974, there were Kanata Ponies found right across Canada, but the majority were still located in the western provinces. In 1975, Kanatas competed in the Chilliwack International Horse Show and at the All-Breed Pony Show in Cloverdale, BC, where a Kanata filly won the “any-other-breed registered foal of 1975” class, defeating a dozen other entries. The new breed was gaining attention and, with nearly 900 registered Kanata Ponies by 1976, the association appeared on the brink of achieving its goal. Unfortunately, an unforeseen conflict started causing problems for the Kanata registry: a western-type Appaloosa pony from the USA called the Pony of the Americas. In Iowa, in the 1950s, Shetland pony breeder Les Boomhower bought a part-Arabian Appaloosa mare that, when bred to a Shetland stallion, produced an unusual colt foal. The colt, named Black Hand, was snow white with striking black leopard spots, and proved as amenable as he was beautiful. Boomhower decided that Black Hand would be an excellent prototype for a new breed. Using crosses of various breeds, primarily Welsh-type ponies with small Arabians, Quarter Horses and Appaloosas, he succeeded in creating an Appaloosa-spotted western-style children's pony. The name Pony of the Americas (or POA) was selected because some of the original ponies chosen for registration came from Canada, the United States and Mexico. A registry was founded in 1954, and all ponies who fit the breed standard for size, temperament and Appaloosa characteristics were allowed into the new registry, regardless of breeding, even if the ancestry was unknown. Meanwhile, in Canada, all was well with the Kanata until March of 1976, when the Kanata Pony Association was notified that a Canadian Pony of the Americas had been recognized as a breed, despite the CPOA club having fewer than 25 ponies to register, compared with 870 Kanatas with known pedigrees. 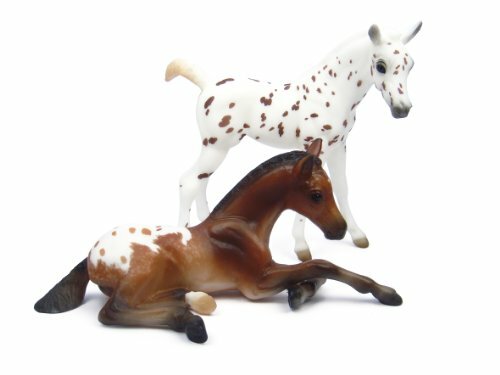 Although the two breeds of pony were created for similar reasons and both had Appaloosa spots, their backgrounds and breed standards were different. The POA included Arabian and Quarter Horse blood, and the type was Quarter Horse but with an Arab-like head. The Kanata had no Arabian or Quarter horse blood, and was intended to look more like a small spotted Thoroughbred. The POA size range only went from 46 to 54 inches, while the Kanata included all ponies of correct type under 56 inches. Some Kanatas were bigger than the POA size restrictions, and some were smaller. According to a report by the Canadian Kanata Pony Association published in the newsletter Horses All in December 1984, the Association was told in 1976 by an official with Agriculture Canada that it should merge with the CPOA Club instead of continuing to develop a Canadian spotted pony breed. Owners and breeders were very upset, feeling that the two breeds were sufficiently distinctive due to size, type and pedigrees. Kanata owners sent letters to the Department of Agriculture complaining about the CPOA being recognized so quickly and with so few animals when the Kanata club had been working with the Department for years to achieve this goal. To try and solve the impasse, the Canadian government gave the CPOA club one year in which they could register Kanatas — which already had their own registry and pedigrees — as CPOAs of “unknown” breeding. This infuriated the Kanata owners and breeders who had worked hard to maintain pedigrees, keep registration records and create a distinct breed type, but some decided to go for “double registration” and applied for their Kanatas to be accepted as CPOAs. Instead of ending the one-year moratorium, the government kept extending it, year after year, and more and more Kanata soon were double registered, even though the ideal CPOA breed type was different from that of the Kanata. A spotted pony similar in type to the now-vanished Kanata Pony. This one is from Switzerland. By 1982, the Kanata Registry, with 1,017 ponies, had passed the magic number required for breed status (although that requirement had not been applied to the CPOA). A Certificate of Recognition was received in January of 1983, making the Kanata Pony a fully recognized breed under Canada's Livestock Pedigree Act. But Cal MacWilliam, Chief Registration Officer, Livestock Improvement, Agriculture Canada, Department of Agriculture, began waffling. He said that the two breeds must be kept distinct and separate, but also said that a Kanata/CPOA cross could be registered as a first-generation Kanata. Then in May, he stated that the original pony/Appaloosa cross used to create the Kanata would not be considered a first-generation Kanata. What was going on? MacWilliam's two statements were contradictory. Correspondence went back and forth. Despite this confusion, all seemed to be going fine for the Kanata until July 1983, when the CPOA asked to amalgamate the Kanata into the CPOA registry. Kanata club members voted 21-0 against this. The government began requiring more and more information from the Kanata registry, including grading charts, a new constitution, new bylaws, new definitions for breeding stock and so on. When that was completed, an inspection of all third-generation ponies was demanded in March 1984, at the end of winter with the ponies not in show condition. A request to hold the inspection at the annual show in July, when the ponies would be fit and in summer coat and all gathered in one place, was denied. The inspection of the third-generation Kanatas took place in March, followed by an inspection of CPOA ponies. These were done, not by licensed horse show judges, but by MacWilliam and a veterinarian. The Kanata club stated that, at that time, most of the CPOA registered ponies were of Kanata origin, not POAs at all, so the club asked that only CPOA ponies of known American POA breeding be inspected, so that the differences could be seen. But MacWilliam admitted that he did not check the papers of the CPOAs he inspected. Because the inspectors — who, according to the Kanata club, said they professed “not to know much about horses” — reported that they saw little difference between the two breeds, on March 26, 1984, Agriculture Canada rescinded recognition of the Kanata Pony, despite the department having said in 1976 that they could not rescind the CPOA's recognition. More letters flew back and forth, but the government held firm. But the picture was a little less clear than that. A member of the CPOA club also published a report in Horses All in 1984 under the name of Sari's Ponies. That person, whose name was not published, claimed that the Kanata Pony was based on ponies of POA breeding — exactly the opposite of what the Kanata club had said! When the CPOA was recognized in Canada, many Kanatas were re-registered as CPOAs because, said Sari's Ponies, they were really one breed. And, since the CPOA had achieved official recognition first, it claimed that the Kanata club was just that: a club handing out meaningless registration certificates. As well, this person said that his or her ponies had had their registration certificates voided by the Kanata club because they included POAs in their pedigrees, and that this had happened to other club members as well. That was interesting, since while this person claimed the breeds were the same, in revoking registration for ponies with POA breeding, the Kanata registry proved that it did not agree. Unfortunately, they had little choice. With the Kanata pedigrees not being recognized by the CPOA club, and with Agriculture Canada stating that the Kanata had no future as a separate breed, its fate was sealed. Agriculture Canada approval was necessary to continue registering stock, and it was clear that the government had made its choice in favour of the POA. Within a few years, Canada's distinctive spotted pony was gone, swallowed up by the American breed and registered by the CPOA as being of unknown breeding. The POA and CPOA did raise its height limit, which allowed the larger Kanatas to be accepted, but the ones under 46 inches (11.2 hands) were not accepted. This is interesting, because Agriculture Canada had demanded full pedigrees and evidence of third-generation Kanata-to-Kanata breeding before agreeing to consider the Kanata for recognition. Why were ponies without pedigrees admitted to the CPOA registry under full government approval? The Kanata breeders tried and failed to get an answer to this question. Sadly, with such insurmountable obstacles placed in its path, the Canadian Kanata Pony Association has completely disappeared. When the last of the registered Kanata Ponies died, a part of Canada's equine history died with them. Even photos of them are virtually impossible to find. Today, there may still be purebred Kanata Ponies in western Canada, but without a breed registry, they no longer are considered a breed apart. I had not heard of this before. The only CPOA website I could find is at http://www.angelfire.com/ca3/cpoa/his... but the link to Home no longer works. The website www.canadianpoa.org apparently no longer exists. My thanks to Hanne Olsen of Ontario, who sent me a photo of a Kanata named Polka Dot. More photos and info would be most welcome! Hi There, I bought a horse last yea r and I was told it is a Kanata breed. He is 13.5 hh and is grey he certainly looks like a mix of pony and Apaloosa. I have old show programs from the Kanata Pony Shows. I could not find a single photo of a Kanata Pony to include with this article. If anyone has more information to add, or photos I could use or link to, please let me know! This is all very sad to read. I have been off the farm for 40 years. My family sold the farm when I left home. 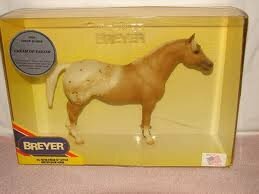 When I left we had a Kanata pony that my grandfather had purchased for my sisters. She was less than a year old when we got her. She got along great with the other horses and ponies but she was more like a pet dog. Loved to be with us always close if she could get near us. I gentle broke her. About 5 minutes after I was on her back for the first time, she slipped on muddy wet grass and down we went. She waited for me to get out from under and clear then up she got, walked up beside me in position for me to get back on, so I did and away we went again. It was like nothing unusual had happened. She once got out when the horses broke down a fence. The gelding took them all to the farm where I had purchased him about 2 years before. When they got there she turn back heading for home even though she had been there before and knew the place. I found her still about 5 or 6 miles from home. I had no stock rack on the pick up truck and did not want to lead her home with the truck, so I opened the tail gate, patted the deck of the truck, up she jumped into the back. I tied her so she could just look over the cab of the truck and drove home at about 15 miles an hours. She loved the whole experience. She was a sweet heart.